Let me help you every step of the way. Whether you are already a homeowner who is thinking of moving up-market to a larger Kamloops home or townhouse, a senior who wants to downsize to a "smaller" Kamloops lifestyle or a first time buyer looking for their first Kamloops apartment, townhouse, half duplex or home with a suite... before you start to get out with me to look at the homes in Kamloops, you must find out whether you are financially prepared to purchase a home. Getting mortgage loan can be an easy process if you have a good mortgage broker. You should not even start to look for homes until you have been qualified by a mortgage broker or bank. Once you are qualified you know how much you can safely afford to borrow, and I can set your search criteria within a comfortable price range for you. You wont be wasting your time, the home seller's time and my time, if you get qualified first. New tougher lending restrictions come into place January of 2018. 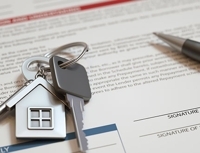 The federal government has tightened lending restrictions. A lender will now have to "stress test" your payment ability as if the rates are 2% higher than the current posted rates. You must get into your bank or broker to see how these new rules will effect what price range you can purchase in. Even if you've been in your house for several years... get into a broker. If you don't have a mortgage broker, I can help you by referring you to several mortgage brokers I work with. If you are thinking about using a Bank for obtaining your mortgage that's fine, but I would also recommend that you also try a mortgage broker. 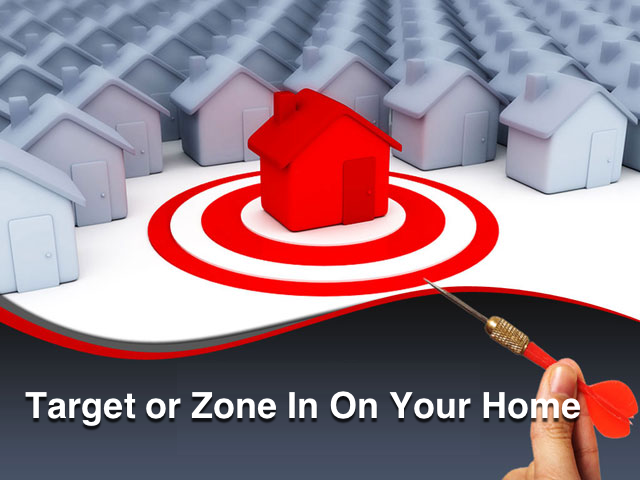 Locating the perfect home is easier than ever before using new technolgy tools like the Kamloops PCS system and the new consumer app Xposure. You may also sign up as a member on my website www.kamloopshomes.com and do your own customized searching. Your first step in the purchasing process is to get pre-qualified with a mortgage company. This can be done over the phone or even online in a matter of minutes, but I always recommend going in to meet a broker in person. Personality and the ability to communicate with your broker is important. Get to know your broker and he can get to know you. It works much better if you've been in to a broker in-person. If you don't have a broker, call me and I will refer you to a mortgage professional. One fellow that consistently gets high praise from my clients is Brian Delany. Try this link to Brian Delany of Dominion Lending. As I've written above, it's not as easy to get a mortgage or the amount you used to be able to borrow. 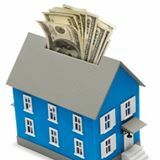 Your next step to buying a home is to first ask yourself why you want to buy a home: to stop paying rent? To start building equity? To have a place of your own? To raise a family? To entertain business associates? To move up to a bigger house? Next, list what kind of home you'd like and where you would like to be. Be specific. 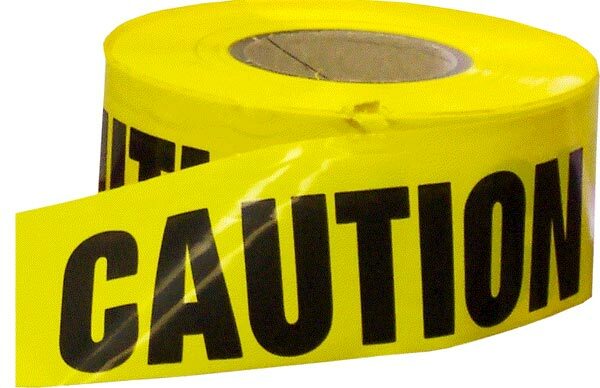 Separate the "must haves" from the "want to haves." Kamloops has lots of neighbourhoods. Aberdeen, Brocklehurst and Sahali are popular areas.. they are usually at the top of the sales (by total numbers), but it should not make you rule out other areas like Barnhartvale, Dallas, Juniper Ridge. All neighbourhoods have there strong points. People that live in Westsyde are for the most part die-hard Westsyders! They love their area. South Kamloops and the downtown area homes are very, very popular with easy acces to the healt care facilites and the business corridors of Kamloops. 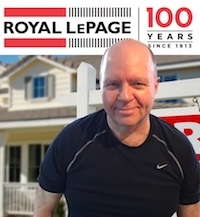 I've helped people buy homes in all neighbourhoods. What if you are new to Kamloops and don't know the neighborhoods and areas? 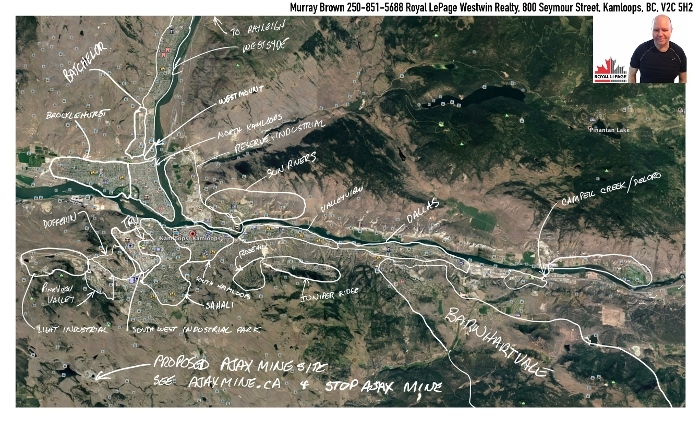 If you are new to Kamloops and don't know the areas, it's sometimes tough to know where the homes you are looking at on the internet are located. To help you I've got some images of Kamloops that I captured off of Google Earth. Using my pencil on my tablet I've marked up the maps with the boundaries of almost all the neighbourhoods that you'll really find helpful. If you would access to my all my maps of Kamloops showing the boundaries of the neighbourhoods use this link. Lots of areas in Kamloops have issues to consider... some areas have concentrations of volcanic fly ash and alkali soils that create leeching problems on concrete floors, other's are built in an area where there might be underground water issues, several areas of Kamloops (where you would least expect it), are in flood plane zones. Some areas may not have storm sewers. Some homes built in the '70 were built with aluminum wiring which can now cause big issues with obtaining house insurance. While on the home insurance topic another flag is galvanized pipe. Once you've been pre-qualified and know what price range you want to stay in, I can help you determine which Kamloops properties fit your needs by using all the tools of the trade... including PCS, Xposure the MLS system. During your purchase process, my service to you will continue. Over the past 20+ years, I have established a strong network of contacts and resources we can draw on if required. These include REALTORS, Inspectors, Mortgage Brokers, Lawyers and Property Inspectors. I have the best possible resources and communication systems available today to help you locate the homes on the market that match your specifications. Feel free to sign up and begin saving your dream home searches here at my main website. Once you join or sign up, you can set your searches to send you any new listings which match your searches. My job will be to show you as many homes in Kamloops as possible, so you ‘learn’ the market and once you find a home you want to buy, my job continues... at this point, I’ll write you a legal agreement or offer and negotiate the offer to get you the best price and terms possible. The offer will ensure you have an adequate time frame to do your due diligence in ‘checking‘ that the home meets all your criteria including a professional inspection, examining the title, securing your financing and more. To learn more about my services click here.